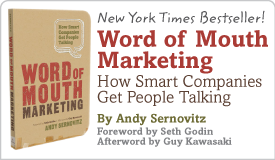 How myths can inspire community members | Andy Sernovitz | Damn, I Wish I'd Thought of That! Here’s a guest post Douglas Atkin, CEO at The Glue Project and author of “The Culting of Brands” wrote for our WordofMouth.org project. Check it out for more great word of mouth marketing tips like this every day. Myths are stories, but with a critical difference. They have symbolic importance. They embody what the community is all about: its purpose, its beliefs, and its actions. Regular stories that relate things like events and achievements and that are captured in photos, videos, and words are good for collective memory-making and co-creation — all great things for stickiness. They become elevated to a special status because they have more meaning. For the Apple tribe (yes, there is one) the story of a very young Steve Jobs flouting convention and pitching venture capitalists in his shorts and sandals in the earliest days of the company perfectly symbolizes the values of the group: be different and don’t conform. (Apple users all think they’re more creative and less conformist than the rest of the world. They can be insufferably smug. I confess that I’m one of them.) This story is told and retold by Apple users who weren’t even born when it happened. The life story of Mary Kay Ash, the founder of her eponymous company, is also told and retold by thousands of Mary Kay consultants. She was passed over for promotion by her previous employer in favor of a man she had trained. Infuriated, she left and started her own business brewing cosmetics on her kitchen stove. Working from home was important at that time. She needed to support and care for her family as her husband was dying. The empire she built was based on recognition and celebration of women’s entrepreneurial ability. The pink Cadillacs and the huge mutually supportive annual event at Dallas are all about enabling women to beat the odds and become their best (the bee is a key piece of iconography for the company — it flies despite its improbable aerodynamics). The Mary Kay consultants I interviewed would tell this story with tears in their eyes. It perfectly embodied the values of the company. And, importantly, they felt it was a perfect expression of their own self-story. Paula (not her real name) had been fired despite leading a graphics company’s sales department to impressive records. She ran the department according to her own personal values: support your staff, make them feel they can do anything, don’t use fear as a driver. The company took a different direction that contradicted these values, and despite delivering superior results, she was let go. Faced with trying to figure out how to support herself and her two-year-old son, she accepted an invitation from her friend to go to a Mary Kay party. She recognized that the company’s values were her own, joined as a consultant, and rose through the ranks. Paula told the story of her joining as if it was ‘meant to be.’ Mary Kay Ash’s story was both an inspiration to her and reinforcement of her own choices. It was almost the same story. The founder’s story was the master narrative of the company. It embodied its values, and was reflected in the personal narratives of its members. These special stories will emerge. The art is recognizing them for what they are and then celebrating and circulating them. If you think they express accurately (and inspirationally) what the community is all about, find ways for the membership to absorb and retell them. Often, if they’re really good, membership will find ways to do it on their own!